Threadless.com is an online store that sells t-shirts and other apparel designed by its users.Anyone can submit a design to the site, which is put to a public vote for seven days. The artists whose designs make it past the vote receive $2,000 in cash, a $500 gift card (or $200 in cash), and an extra $500 for each reprint of that design. 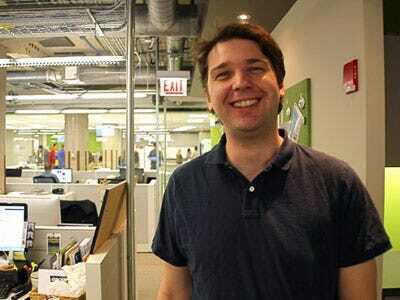 Threadless was founded by Jake Nickell and Jacob DeHart in November 2000 after Nickell won a t-shirt designing competition. It started as a hobby in which they continued the t-shirt design competition on a message board. However, the hobby soon became a business and Nickell had to learn how to print t-shirts, send out orders, and accept credit card orders. “We started with $1,000, printed as many shirts as we could with it, sold those, then printed more,” Nickell tells us over email. In their first year of business, Nickell and DeHart sold “a handful of tees” designed by a “handful of artists.” Today, over 300,000 designs have been submitted to Threadless from close to 100,000 different artists. “We’ve printed over 3,000 of them so far, paid out millions of dollars to artists and are currently selling millions of tees each year,” says Nickell. 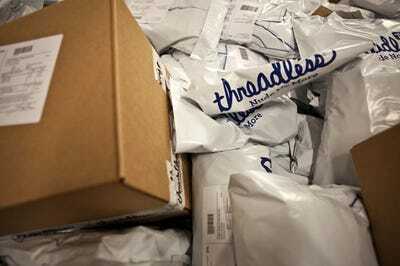 The Threadless co-founder goes on to say that his business has been profitable since its first month in business, and that the company’s growth is “still in the strong double digit percentages year over year.” While the startup won’t disclose how much cash it’s pulling in, Forbes found out that Threadless made around $30 million of revenue in 2009. What’s also interesting is that some people are making a living off of their Threadless designs. Although the Threadless payout to its designers was never meant to become people’s main source of income, Nickell tells us that this is the case for some people living in places where the cost of living is much lower. T-shirts just blend into the walls here. 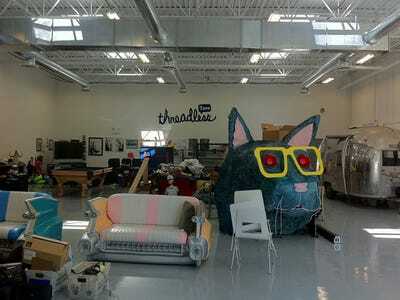 Threadless will make a store within this section of the warehouse, and we think they should leave the large mouse right in the middle. 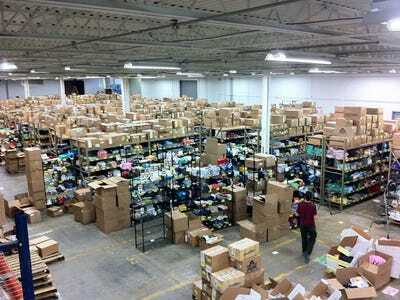 Now this is what a warehouse that ships out millions of t-shirts a year looks like. and he gets some help from co-worker Dustin Currier. which are packed into these boxes or bags. 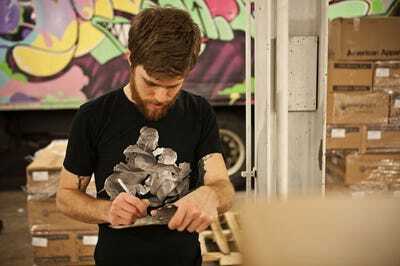 Threadless employee Danny Rose transfers a bunch of shirts ready to be shipped around the world.